820000 quarter sized equivalent photovoltaic (PV) modules? With “KSK Surya Photovoltaic Venture Selects SunFab Solar Panel Production Lines for 150MW Project in India”, Applied Materials, Inc. (NASDAQ:AMAT) ended an almost one year three month drought since the last SunFab deal with Moncada Energy Group s.r.l. per “Moncada Enters Solar Energy Market with Contract for Applied Materials’ SunFab Thin Film Line”. Should this be viewed as a positive sign of at least a slow recovery from the Great Recession and credit crunch? Perhaps a better question is how have Applied Materials SunFab customers fared to date? In “VLSI Research ranks Top 10 PV Manufacturing Equipment Suppliers for 2008”, I didn’t calculate the MegaWatt-peak (MWp) cumulative production of Applied Materials SunFab customers. 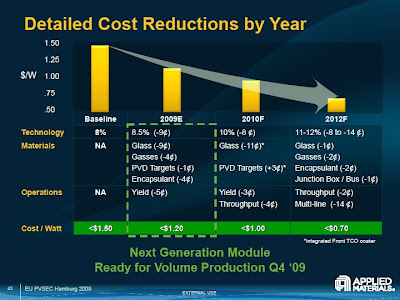 At Intersolar 2009 (Munich), an Applied Materials executive told me “SunFab customers had cumulative production of about 300000 quarter sized modules.” As time has passed, I double checked the number with the AMAT Public Relations team for this post. When I got the revised number, I was surprised, even astonished: “820,000 1/4 size equivalent panels.” That is an over 2.7 times cumulative production increase since Intersolar. A quarter (1/4) size equivalent module (panel) is a SunFab signature 5.7 m2 (square meter) panel divided into four (4) modules. The figure contradicted information from other sources indicating many SunFab lines have been idling or in low volume production. Upon my questioning, AMAT said this is the total number of modules manufactured all the way through the line (modules out), and Applied cannot comment on what customers sell but our yields on these modules are running very high (in the 90’s). Again, without knowing the module mix from SunFab manufacturers, single junction a-Si (amorphous Silicon) PV modules range from about 78 to 90 Wp (Watt-peak) and Tandem Junction a-Si/μc-Si (amorphous and microcrystalline Silicon) modules range from say 110 to 120 Wp translating to anywhere from 64.0 to 98.4 MWp (MegaWatt-peak) of cumulative production. 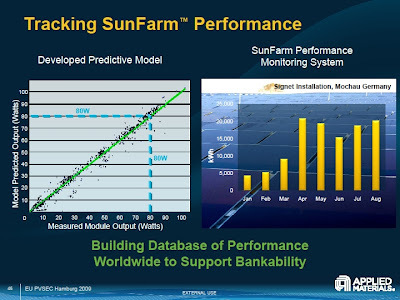 Given yield uncertainty and only two SunFab customers, Sunfilm AG and ENN Group, have tandem lines, I guesstimate the actual number is skewed towards the lower 64.0 MWp. Ignoring the timing of SunFab line factory ramps, more than enough capacity is in place to produce 820000 modules. The 9.25% aperture efficiency is for tandem modules, and I will posit the ~$1.20/Wp production cost may just be a projection for multiple Tandem Junction SunFab lines. Relentless price erosion in the 2009 PV market has squeezed a-Si modules the hardest. 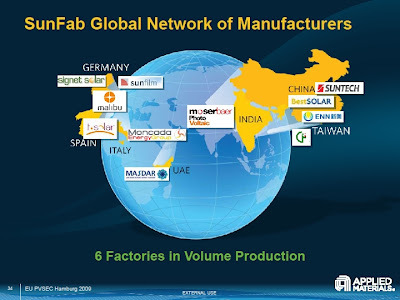 SunFab manufacturers produce modules with lower efficiencies =and= at higher production costs than industry leader First Solar, Inc. (NASDAQ:FSLR). Crystalline silicon solar modules have further pressured the a-Si value proposition with high efficiency at a relative low cost driven by cheaper polysilicon. In the 2009 PV buyer’s market, a-Si modules are waiting behind First Solar and crystalline silicon manufacturers as inventories are cleared. 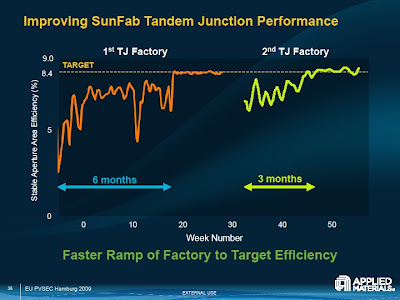 Per one of my tweets last week, 2010 may prove even worse for SunFab a-Si and tandem modules. Nuying Huang and Adam Hwang report “Major China PV module makers lower 1Q10 quotes to 1.2-1.3 euro/watt” for DIGITIMES (subscription may be required) setting an even lower price ceiling for SunFab modules. Which leaves the key question, where have all the SunFab PV modules gone? The Signet Solar Product Installations page still cites their 230 kW rooftop installation at the Signet factory in Mochau, Germany, as their largest to date. Meanwhile according to “Signet introduces 400W single junction silicon module” by Syanne Olson at PV-tech.org, “Signet says its production line is operating at full capacity.” In August 2009, Sunfilm was proud to announce “SUNFILM AND SUNOVA PUT MORE THAN 1MWP OF THIN FILM TANDEM JUNCTION MODULES ON ROOFS”. “Moser Baer to develop a one megawatt solar farm project in Maharashtra, India” followed in September. And “Duke Energy, China’s ENN to build solar power projects” by Arundhati Ramanathan for Reuters was a significant late week deal for the ENN Group without mention of project sizes or the shipment of a single module, yet. If SunFab a-Si and tandem modules are indeed selling through and not stacking up in inventories, how close to manufacturing cost do they need to be priced to sell?